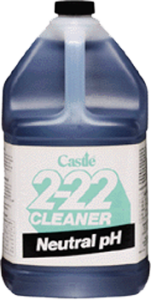 Castle® 2-22 Neutral™ is a true neutral cleaner with a pH of 7 – 7.5, and is formulated to clean any washable surface without leaving a dulling residue. It will not harm waxed or polished surfaces. 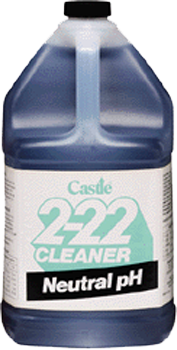 Castle® 2-22 Neutral™ does not need to be rinsed, and is free of Butyl Ether. 1. For wet mop: 1/2 ounce – 2 ounces, depending on surface to be cleaned. 2. For automatic scrubber: 1/2 ounce – 1 ounce per gallon. 3. For general purpose cleaning: 4-6 ounces per gallon.